Mardi Gras La Jolie mask is from Gypsy Renaissance's Mardi Gras Collection. 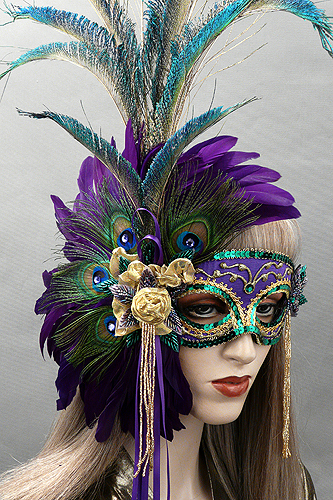 La Jolie is a purple, green, and gold mask with peacock feathers and satin ribbons. Mardi Gras La Jolie mask is covered with hand painted regal purple moiré fabric and decorated with metallic gold braiding and green sequin trim. 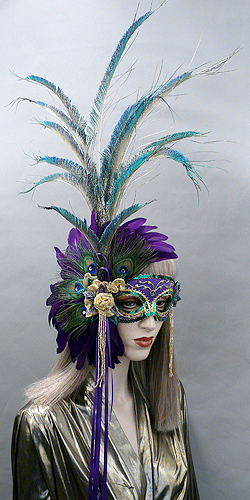 Mask is adorned with a semi circle of regal purple coque feathers and peacock eyes, topped with gold painted peacock swords. Mask is embellished with glass beaded leaves, gold glass beaded dangles, and regal purple satin ribbons. Mask is finished with amethyst and emerald rhinestones and a handcrafted french ribbon rose. Click here for Mardi Gras Companion mask. La Jolie is also featured in our French Collection.